Premium 10m displayport cable for transferring high-bandwidth, uncompressed digital video, multi-channel digital audio and control functions. Supports resolutions up to 2560 x 1600 and 1080p. Supports 8 channel, uncompressed 24bit audio. Bandwidth: 2.7Gbps per lane (total10.8Gbps). 10 year warranty against manufacturing defects. Sorry this item is out of stock until end of March 2018, backorders can be placed and it will ship as soon as stock arrives. 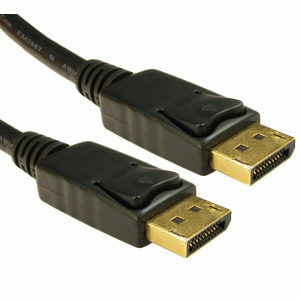 DisplayPort is the latest generation of licence free digital connector designed primarily for connections between computer and display monitor and next generation tv. The Display Port cable connector can pass HDMI, DVI and VGA via a Display Port Adaptor or Display Port Converter. 10m DVI Cable DVI-D Dual Link Ferrite supressors both ends 24+1 Pins Supports up to 2560 x 1600 resolution This 10m long DVI cable is ideal for connecting a PC to a monitor, it features 24+1 DVI-D connectors both ends. DVI-D connectors will also plug into DVI-I sockets but only transfer the digital signal. Less than half price, whilst stocks last. 1m Mini Displayport to Displayport Cable, Male to Male. Male to male connectors. Gold plated contacts Colour white. Length 1m. Ideal for connecting a Mac or Microsoft Surface Pro equipped with a mini displayport connector to a monitor. 10m triple shielded VGA cable, connects a VGA equipped PC, Laptop or DVR etc to a monitor, television or projector. 10m VGA Monitor Cable 15 pin cable with foil, braid and drain wire Nickel plated shell with gold plated contacts. Ferrite suppressors fitted both ends. Fully wired to allow DDC data connection.